Yesterday we arrived in the Cinque Terre for a brief visit to our favorite village of Manarola. We had an afternoon available to us and so we decided to hike some of the paths that we had never explored before. It was easy to find the Manarola train station and to buy an inexpensive ticket to Vernazza, one of the other villages. We waited on ‘binario 2’ for a few minutes and the train arrived. It eased out of the station and through a short tunnel. In only five minutes we were at the Corniglia station, where you can depart and take the weaving brick walkways up to the town. Or, you can stay on the train and continue on to Vernazza, as we did. The train lets you off in a tunnel, and from there you take a few steps down into the town. Vernazza is a charming place with narrow streets, although it is very popular with tourists and is filled with souvenir shops. American can be heard spoken everywhere, as this place has been popularized by Rick Steves and other travel writers who speak of it glowingly. For my tastes, I prefer Manarola because it is offers a place of peace away from the beaten path. There are several fine restaurants and shops and a scenic cove where it possible to relax with a glass of wine at the end of the day. On our single day in the Cinque Terre we hiked first from Vernazza to Corniglia, which is path number 3. This and path number 4 (Monterosso to Vernazza) are the more demanding of the four, with more ups and downs on often uneven stone steps along the hillside. It only took a bit more than an hour to reach Corniglia, the only village of the five that lies on top of a hill. One new feature we noticed on the paths is that there are now signs that tell you how to call for help if you need it, along with location information that pinpoints where you are. We rested a bit in Corniglia and then made our way down the incredible winding walkway that takes you down to the train station, where path number 2 begins. It was a good day’s work, and as dusk descended, it was a delight to walk back into Manarola once again. 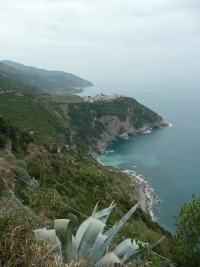 This entry was posted in Cinque Terre and the Coast and tagged Cinque Terre, Corniglia, Manarola, Vernazza. Bookmark the permalink.